Cake, I Love You + The Black Cow Malted Chocolate Stout Cake Recipe | Good. Food. Stories. I’m on record as saying that if I had my druthers, I’d rather make a dessert than anything else when asked to bring a dish to a party. For crowd-pleasing potential, there’s nothing finer. 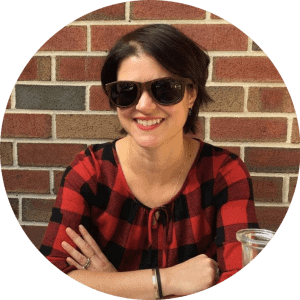 And thanks to Jill O’Connor’s Cake, I Love You: Decadent, Delectable, and Do-Able Recipes, I have a whole new arsenal of cakes to unleash upon group dinners, summer picnics, and festive occasions galore. Obviously cake recipes are going to be decadent and delectable in Jill’s hands—she’s a dessert whisperer, as evidenced by her previous cookbook, Sticky, Chewy, Messy, Gooey. But it’s the word “do-able” in the book’s subtitle that is equally accurate and reassuring. If the idea of making and frosting anything more complicated than a sheet cake terrifies you, don’t panic! The recipes in each chapter are organized by degrees of difficulty. 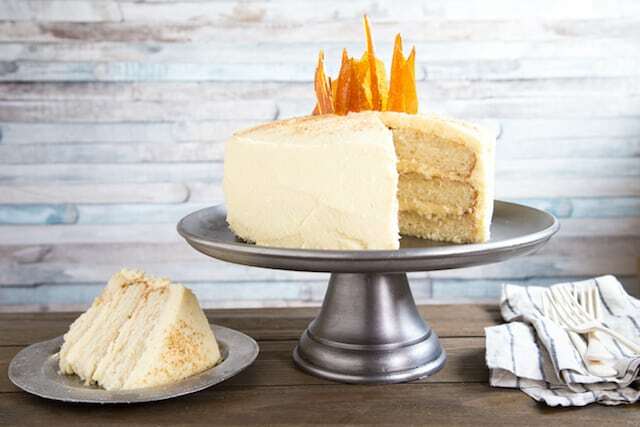 Starting with one-bowl snack cakes and loaf cakes, segueing into more ambitious layer cakes and finally to multi-tiered wonders, the chapters ease you into ever-higher levels of cake mastery. When summer strawberries are at their ripest and sweetest, they’re all the decoration you need for a summer berry St. Germain cake. 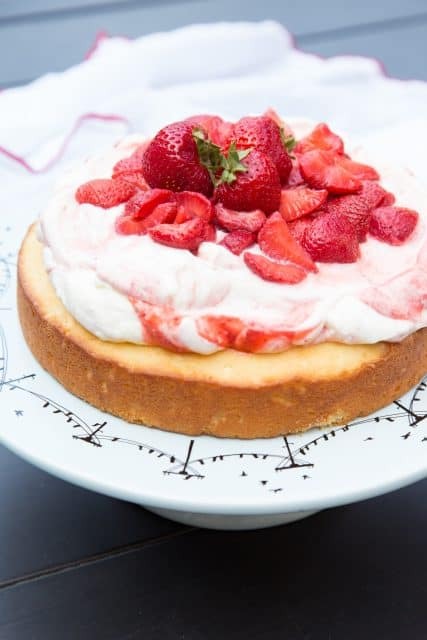 A single layer of lemon-buttermilk cake is piled with St. Germain-soaked strawberries and fragrant strawberry puree swirled with freshly whipped cream—no finicky cake decorating skills necessary. Need something comforting? 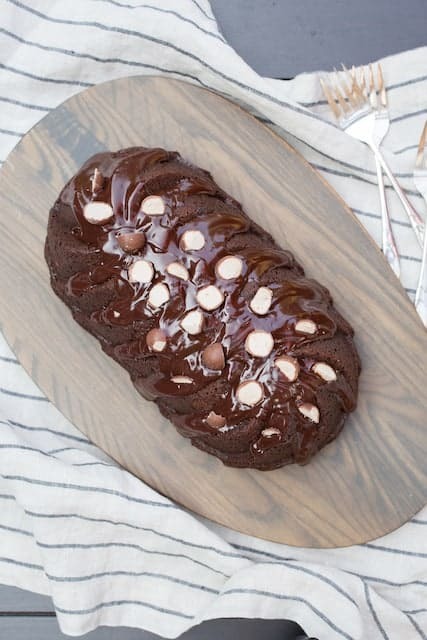 Go for a luxurious loaf or pan cake, with options ranging from a classic diner crumb cake to a banana-brownie swirl cake to a Black Cow loaf cake (recipe follows below) spiked with rich milk stout beer and malted milk powder. Because I realize that “fun” is relative when it comes to making statement cakes like those above, Jill and I thought we’d whet your whistle with one of the recipes from Cake, I Love You that are more modest in ambition, but big and bold in flavor. The Black Cow is like a yoga pants tuxedo: it’s crazy elegant but still comfortable enough for any event, from a backyard party to a holiday dinner. A gentle reminder that making this cake (and all baked goods) is infinitely easier and more efficient when you’re using a kitchen scale to measure your ingredients. Jill’s included grams and ounces in every recipe, so you don’t have to worry about scooping, sifting, and washing all those measuring cups after the cake’s in the oven. Grab your scale and get moo-ving with the Black Cow! 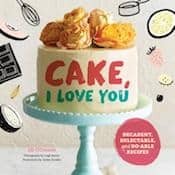 Excerpted from Cake, I Love You: Decadent, Delectable, and Do-Able Recipes, © 2017 by Jill O’Connor. Reproduced by permission of Chronicle Books. All rights reserved. In a 2- to 3-quart) saucepan over medium heat, simmer the stout just until hot—don’t let it boil. Whisk in the brown sugar, cocoa powder, and malted milk powder until dissolved. Remove from the heat and let the stout cool to lukewarm. While the stout cools, whisk the eggs, oil, sour cream, and vanilla together in a large bowl. Whisk the flour, granulated sugar, baking powder, and salt together in a separate large bowl. Whisk the cooled stout into the egg mixture, then gently fold the wet ingredients into the flour just until a thick batter forms. Do not overmix the batter, or the cake will be tough. Scrape the batter into the prepared loaf pan and smooth the top. Bake for about 55 to 65 minutes, until a wooden skewer, knife, or cake tester inserted into the center of the cake comes out clean. Transfer to a rack and cool in the pan for 10 minutes, then carefully remove the cake from the pan to cool completely: either use the parchment paper to lift the cake from the pan, or gently invert the cake onto the rack. 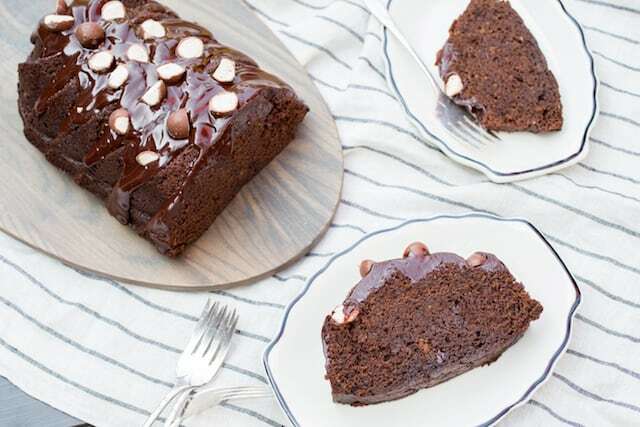 While the cake cools, make the glaze: place the chocolate, cream, and malted milk powder in a small (1-quart), heavy-bottomed saucepan over medium-low heat. Whisk constantly until the chocolate is completely melted. Remove from the heat and whisk in the vanilla extract. Drizzle the glaze over the cooled cake, letting it drip down the sides of the loaf. Sprinkle the top of the cake with the chopped malt balls and chocolate curls, if using. Let the cake sit for at least 1 hour until the glaze is set before slicing. Make ahead: Wrap lightly in plastic wrap and store at room temperature for ups to 3 days.